I recently came across this article, and at first glance, I admit that I wasn’t very taken. Maybe it was because I don’t find G.I. Joe action figures so relate-able to my life in the first place. Even when I saw the photo of one of these figures standing in tree pose, I assumed that it was a woman who wanted to turn these war figurines into something more peaceful. I hesitated on whether or not I wanted to take the time to read the article. For some reason, I did open it up, and with every sentence that I read, I grew more and more interested! Perhaps the most surprising and exciting piece of this article (to me), was that this idea was a man’s- one who had spent an incredible amount of hours trying to change the shapes of these figurines, encountering failure after failure, but each time, seeking out a new method to make his vision a reality. As I read through the article, the brilliance of his idea, layered with so many levels of meaning, seeped into me. Imagine a world in which people didn’t seek to destroy each other, but practiced peace instead. What if children were introduced to the idea of embodiment, of directing the shape of their lives and finding the calm within themselves despite the turbulence around them? 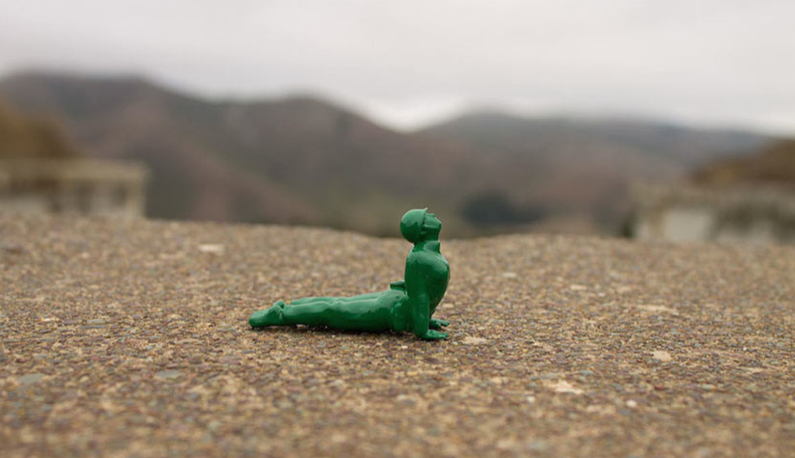 What if all people who serve or have served in the military had access to yoga classes which could help them deal with post traumatic stress disorder and the myriad effects of combat? (Did you know that we lose a veteran to suicide every HOUR?!). I love the hopeful message that this product sends out to the world, but what I find even more inspiring than the end result is the dedication that this man put into this project despite the many obstacles and lack of support received during the process. It’s hard not to feel excited when someone pours their heart and soul into a project that makes the world a better place, and in the end becomes successful! This story serves as a wonderful reminder that we must stick to our own paths and trust our own intuition, no matter what anyone around us says. This is what the world truly needs. What if we all followed our own hearts’ desires and used our unique gifts to better the world we live in? Like pieces of a jigsaw puzzle, with our own strengths and qualities, we each play an important role and fit together into the workings of a bigger picture. What if instead of dashing one another’s hopes and dreams (something that can only come from a place of one’s own insecurity and lack of fulfillment), we inspired and helped each other succeed at the things that light us up and serve the greater good at the same time? This example shows us what the outcome can be.